For many of us, it takes an entire lifetime to accept who we are to become in order to begin the process of saluting ourselves with the highest regard. In the midst of life’s crises and challenges, we often forget how strong we are and can be. We forget how to be brave. But we don’t realize how many of those unfortunate predicaments are pushing us forward, forcing us to grow and gain mental stability. After all, courage helps us to become whole beings. Bravado requires a form of transformation – not in a physical capacity – but in the spiritual realm of the heart. Being brave doesn’t necessarily mean winning as an end result, nor does it mean walking away from an issue of importance that needs to be addressed. Courage is something that we are never depleted of but must dig deep for its employment. Most times, far less courage is required to deal with those things that are less painful, more conventional, more popular, or easier to understand. The brave outer work demands the multilayered inner work. And the braver the choices we make, the more likely we are to attract criticism, but that’s what makes a choice brave in the first place. 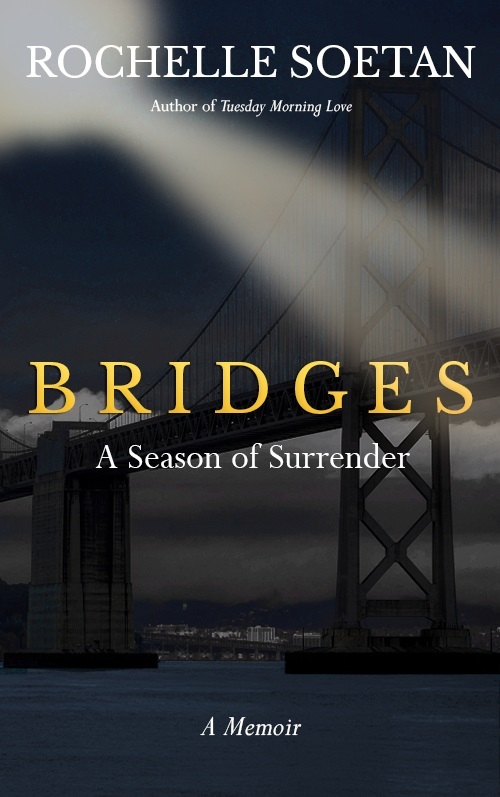 Award-winning author and TML publisher, Rochelle Soetan, vividly shares her best work yet in new memoir Bridges: A Season of Surrender, a narrative of one woman’s journey of redemption, inspiration, and a return to self-love. A true story of nearly two decades ago, the author candidly invites the reader in for a front row seat of a journey which transported her from fear to bravery, while standing on the edge of a city bridge at 2 o’clock in the morning. Her passion and activism through literature, speaking, mentoring, and advocacy for mental health and suicide prevention is to encourage readers to initiate a bit of awareness and bravado into their own lives, and perhaps, the lives of others. Her writing aims for the transparent and very human, much like the blog Tuesday Morning Love, and her fearlessness to address subjects of trauma, consciousness, living, memory, transformation, hope and personal accountability have become her trademark. Rochelle Soetan has been writing this story, intermittently, and for eleven years. The timeliness of this release comes at a pivotal point in American history, one that explores mental health disorders such as depression, and draws attention to the increase in suicidal ideation and statistics over the past five years. According to the Centers for Disease Control and Prevention (CDC), in 2015 suicide was the third leading cause of death among individuals between the ages of 10 and 14, and the second leading cause of death among individuals between the ages of 15 and 34. To date, suicide has been the tenth leading cause of death overall in the United States, claiming the lives of more than 44,000 people. In 2015, there were more than twice as many suicides (44,193) in the United States as there were homicides (17,793). In this book, the author teaches readers how to use the bridge to cross over from despair to worthiness and wellness. Bridges will provide readers a bridge to connect to their inner resilience while being blanketed with beautiful words of insight, encouragement and inner strength. Pulse is the companion chapbook to the memoir Bridges: A Season of Surrender and renders a collection of spiritually poetic narratives. This is Rochelle Soetan’s first published complete collection in 30 years. love and light for your conscious journey! Previous PostA Season of SurrenderNext PostWhere’s the Monster?